Your chance to own an affordable Damien Hirst artwork in appropriation. Part of our Democratizing Art series. 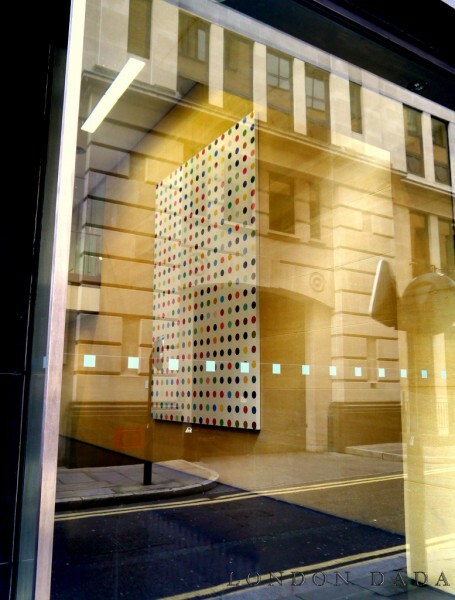 Photograph of Hirst’s 1995 iconic spot painting Biotin-Malemide as seen from outside Deutsche Bank in Winchester St in the City and set within glass reflections of the street outside. Taken from a pavement stance outside the thick pane glass bank front with the painting’s frame carefully alinged with the opposite buildings, road and road furniture reflections; appearing to place the spot painting in a street setting and the iconic Hirst work, now in copyright-legal appropriation, accessible and affordable to the collector and public alike. * Remaining 7 signed editions are on sale at a fixed price of £1000 each. *Please note. As numbers of available signed print editions of London Dada works diminish, prices are subject to increase, for example signed editions 1- 20 of Biotin-Maleimide St were on offer at between £250 – £400 during early 2013. 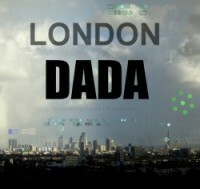 Therefore early investment in Dada’s historic London expression is advised. * October 2014 – this edition new sold out. To reserve a re-sale please register interest via Contact Us, above.